While previous generations may have been content to live in drafty houses, most people now want comfortable, warm houses. A healthy house today is well sealed, well insulated and properly ventilated. A well-insulated house is a bit like dressing for the weather. A wool sweater will keep you warm if the wind is not blowing and it is not raining. On a windy, rainy day, wearing a nylon shell over your wool sweater helps keep you reasonably dry and warm. A house is similar. On the outside, underneath the brick or siding, there is an air barrier that does the same thing as the nylon — it keeps the wind from blowing through. Then there is the insulation (like your sweater) and a vapour barrier, which helps keep moisture away from the house structure where it can do damage. R-values and their metric equivalent, RSI values, are a way of labelling the effectiveness of insulating materials. The higher the R-value or RSI value, the more resistance the material has to the movement of heat. Insulation products sold in Canada are labelled with R and RSI values. Provincial building codes specify minimum R (or RSI) values for new construction, with different values for various applications. It is important to know what your local building code requires when planning new construction. Note: The way the insulation is installed plays a large role in its effectiveness. Compressing the insulation, leaving air spaces around the insulation and allowing air movement in the insulation all reduce the actual R-value of the insulation. An air barrier, which prevents the movement of interior or exterior air through the system. Carefully filled cavities, which leave no gaps in or around the insulation and which do not compress the insulation. A minimum of thermal bridges. These are parts of the wall that, with a lower R-value, extend from the warm side to the cold side of the insulation, giving heat an easy escape. The structural members in the wall will often be thermal bridges. A vapour retarder, such as polyethylene sheeting, which prevents moisture from moving from warm interior spaces into a colder building envelope where it could condense. Drying potential, which is the ability of the insulated assembly to release any moisture that gets into the system. The vapour retarder should be at or near the inside surface of the insulation and would most commonly be six mil (0.2 in.) polyethylene sheeting at the inside face of the studs or vapour retardant paint on the finished drywall. 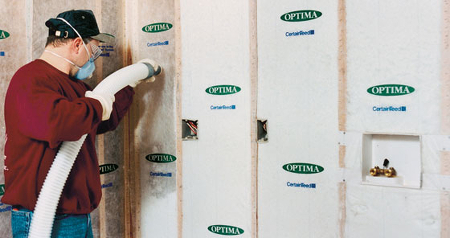 The air barrier can be provided by the polyethylene vapour retarder, by the interior drywall or by air-barrier sheeting on the exterior face of the studs. In all cases, the air barrier must be carefully detailed to be continuous at all penetrations. Adding rigid (board-stock) insulation to the outside face of the studs minimizes thermal bridging. Spacing the studs at 610 mm (24 in.) rather than 406 mm (16 in.) where possible will also reduce thermal bridging. The cost of getting at and repairing the walls is a significant part of the work and cost of the project. Both air and vapour barriers are required. The interior painted drywall can be both an air and vapour barrier, but details at windows, electrical outlets, floors and other penetrations must be done carefully to reduce air movement through the wall as much as possible. Air movement can lead to mold growth and decay of the walls, as well as loss of insulation efficiency. An insulation must be selected that will completely fill the cavity and not settle. Some insulations, such as foams, can provide sound air barriers themselves. The attic is often the most cost-effective place to add insulation. Usually, a contractor blows loose fill into and over the top of ceiling joists. For the do-it-yourselfer, batts laid sideways on existing insulation are a natural alternative. The air barrier at the ceiling line must be tight to ensure warm moist air from the house does not get into the cold attic and condense in the winter. Check ceiling light fixtures, the tops of interior walls and penetrations such as plumbing stacks for air leakage. Ensure that soffit venting is not blocked by added insulation; baffles may have to be installed. Basement walls are unique because they must handle significant moisture flows from both inside and outside the house. The preferred method, from a building science perspective, is to insulate the wall on the outside with rigid insulation suitable for below-grade installations, such as extruded polystyrene or rigid fibreglass. Insulating the outside of the basement works well with dampproofing and foundation drainage. Rigid fibreglass or mineral wool acts as a drainage layer, keeping surface and ground water away from the foundation. The basement walls are kept at room temperature, protecting the structure, reducing the risk of interior condensation and increasing comfort. The disadvantages are the disturbance of landscaping, the need to cover the insulation above grade and the relatively high cost. The basement walls are now at the temperature of the soil or the outside. Any moist air moving through the wall from the inside will condense on the wall. Usually, there is a moisture barrier against the foundation wall and a vapour retarder on the room side of the insulation. As a result, the wall has poor drying potential. Never apply interior insulation to a basement with moisture problems. Fix the moisture entry problems before insulating (see CMHC’s publication A Guide to Fixing Your Damp Basement). The right insulation system can save you money, reduce the amount of energy you use and make your home more comfortable. Keep in mind that installation costs (including changes to the framing, cladding, and finishes) are usually the most expensive part of an insulation project. The local climate has an impact on the cost-effectiveness of any insulating project. Check the cost, heat loss and heat gain of all available options. Review all details to ensure that moisture movement is handled correctly. You can then select the right insulating system. When in doubt, consult a professional. If your home is poorly insulated, it usually pays to upgrade the insulation. If you are building a new home, it makes sense to insulate well now, so you don’t need to retrofit later.